Hello Ladies! There's nothing I love more than a good pampering session, starting off with a nice long soak in the bath with some relaxing bath products. 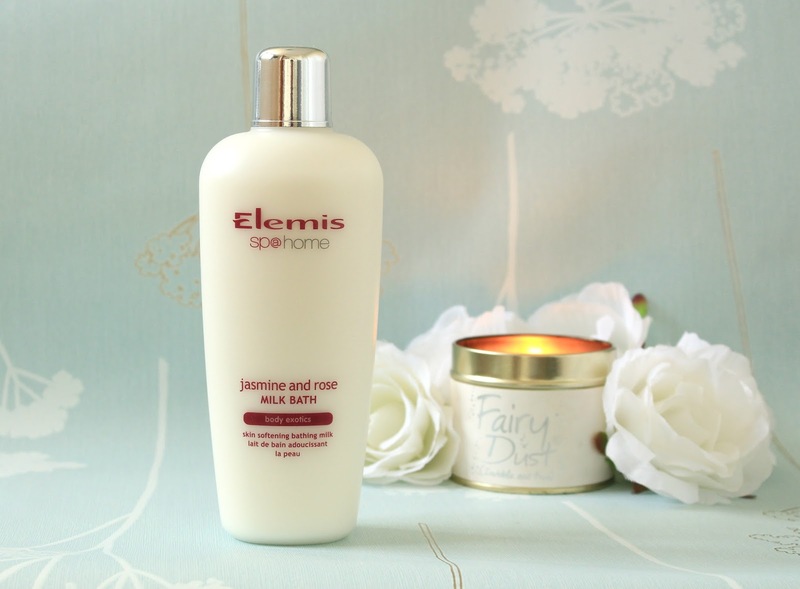 Recently, my weapon of choice has been the new Elemis Jasmine and Rose Milk Bath* which smells divine. The Elemis Jasmine and Rose Milk Bath contains Egyptian Jasmine and Turkish Rose oils which give off a really lovely floral scent, perfect for an evening in the bath (if you can't already tell, this is where I spend far too many evenings). The great thing about this bath milk is its moisturising properties. It contains argan oil and camellia seed oil to protect and moisturize the skin, whilst flower milks of jasmine and white lotus leave the skin feeling soft and smelling divine. One thing I'm terrible at doing is any sort of body care, I have quite dry skin, especially on my shoulders and despite this I still manage to forget to moisturize. This is why I love this bath milk so much, other than it being a lovely luxurious way to relax, it leaves my skin feeling so soft that I don't even need to moisturize. My shoulders are now smooth instead of dry and flaky like they were before and my legs feel great - perfect! This retails for £42 so it is quite pricey, but perfect for a special treat every now and then. If your interested in this you can purchase it here from Time To Spa, or at a counter in your local Debenhams.